The New Black 'Crowley' Tailcoat and Pants Set by Classic Collection is a timeless classic, perfect for any White Tie formal function. 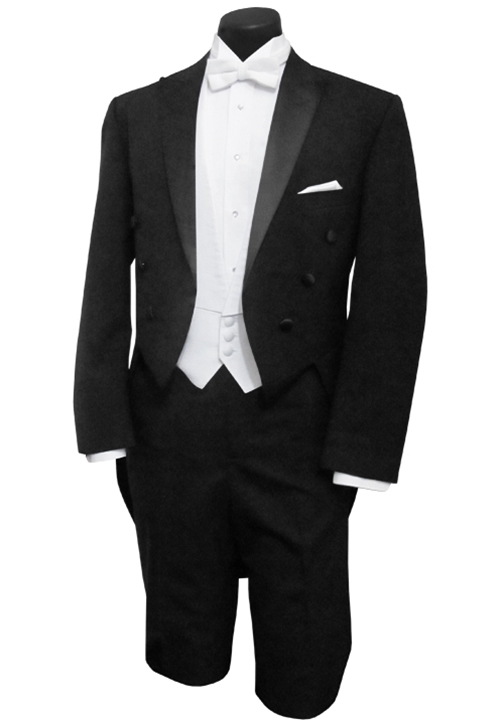 This tailcoat and trousers set is unique compared to the other tailcoat options we offer, for several reasons. Namely, this is the only tailcoat style we offer that comes as a fixed set. That means the coat and trousers are sold together. Whatever coat size you opt for, we will include un-hemmed trousers that are 6" smaller than that coat. The tailcoat features a single breasted, traditional 6 button front, satin peak lapels, full-dress cut, and is fashioned from black polyester. The trousers feature a 3/4" satin stripe, flat front, flex waist size, and are fashioned from the same black polyester material. Together, this tailcoat and trouser set is sure to have you looking your White Tie best! Please note, this is a modern fit tailcoat and trouser set. Men's coats include trousers that are 6 inches smaller than the coat. Example: a 40R Tailcoat will include a 34 Waist Regular Rise un-hemmed trouser. Size 18 Boys Tailcoat comes with an un-hemmed 28 Boys pant. Size 16 Boys Tailcoat comes with an un-hemmed 26 Boys pant. Size 14 Boys Tailcoat comes with an un-hemmed 24 Boys pant. Included: Coat and Pant Set!